NIA CHARLESTOWN NEVIS (APRIL 07, 2015) — Israel’s Ambassador to St. Kitts and Nevis and the Caribbean His Excellency Mordehai Amihai-Bivas says the Jewish community which existed on Nevis would help in building better bilateral relations between Israel and St. Kitts and Nevis. 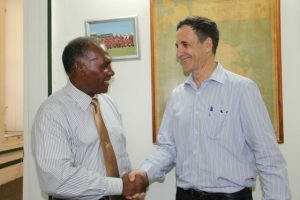 The Ambassador’s comment came when he paid a courtesy call on Premier of Nevis Hon. Vance Amory at his Bath Plain Office on April 07, 2015. “This is something of great importance, of great potential and we shall certainly look into and try to see how we can turn this historical fact which is of great importance to everybody, following not only Jewish history but history in general, trying to understand the origins of this place, the different communities that lived there, the different cultures that were merged together to create what is the modern day Nevis and what is the modern day St. Kitts which I think is important to all of us,” he said.